15 minutes play...BumbleBeans Inc.: Tomato Red? I'm not sure if my fabric choices are tomato red, they are in a reddish, pinkish, orange hue and I'm happy - that's what counts! I like the fabrics you choose. They say tomoato red to me. Maybe it's like wine; it depends on what you pair it with. I think I will visit my fabric stores this weekend. These challenges are helping me look at colors I never thought about (like peach). Thanks for a great combination. Another great block. It screams tomato to me. Works for me! that slash of yellow in there... FABULOUS! Definately tomato! 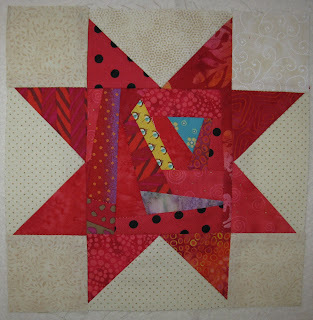 Love how each star point is a different fabric, and the scrappy background too. Lovely work. Terrific tomato block. I love red.